This year’s summer programme is shaping up to be hotter than ever at Winnersh Triangle. Marking the beginning of the summertime events season, the Tent on The Green will make its welcome return along with sunny seating provided by the familiar bright blue deckchairs. The line-up, all accompanied by free ice cream, will include live music and street food, and the opportunity to take part in some activities reflecting the big sporting events of 2018: There will be table football in time for the World Cup; table tennis for occupiers to host their own Wimbledon tournament; and for those who want to channel their inner Rory McIlroy, crazy golf for the PGA championship. Animal lovers can ‘Meet the Guide Dogs’ with Winnersh Triangle occupier, Guide Dogs. The charity will showcase some of their puppies in training and their newly acquired skills as their demonstration team puts the dogs through their paces on a training exercise. Anyone interested in travelling more sustainably will be interested in coming along to the Active Travel event in June. Free bicycle maintenance and bike security marking will also be available. 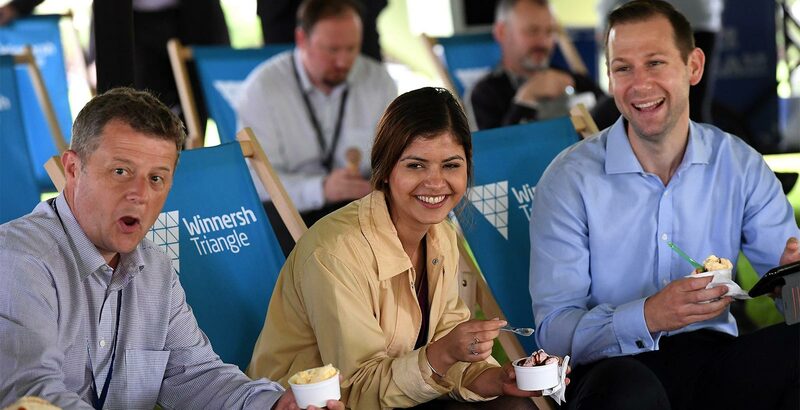 This summer at Winnersh Triangle promises to be one of the best with all the activities on offer, helping people based here to relax and enjoy themselves, and ensuring the park is so much more than just a place to work.